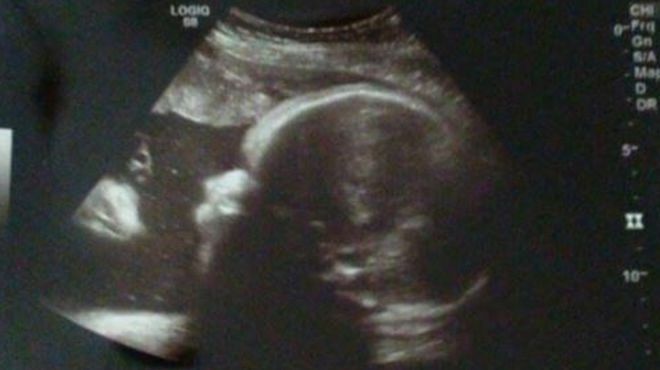 A US couple says they can see Jesus Christ watching over their child in a pregnancy ultrasound. The Pennsylvania pair said a man dressed in a robe with a crown of thorns is looking at their baby from the far left of the image. "When they gave it to us, um, to me it's Jesus," mother Alicia Zeek told a local news station. She said the ultrasound gave them comfort after complications with two other pregnancies. The couple's previous son and daughter were both born with birth defects. Their first daughter has pre-axial polydactyly - she had two thumbs on one hand - and their second child was born with a cleft palate, they told Fox 43. Zachary Smith, the father, says that although the family is not particularly religious, they saw the image as a sign from above. "The angel or God or Jesus, however you want to propose it, I look at it as my blessing," Mr Smith said. "When I seen it, it almost brought tears to my eyes. I was speechless, I just couldn't believe it." Baby Briella was born on Wednesday. Mother and daughter are healthy and doing well. The picture does look as though the image and baby are looking at each other. You mistaken that is deception. Jesus is not wearing no crown of thorns right now He is now King of Kings and Lords of Lords and wearing a crown of righteousness. wake up do his commandments and lets get out of this hell that we are in.